Psychological testing and assessment is also known as personality assessment. Assessment helps the psychologist and client identify and better understand problems the client faces in his or her life. In addition, assessment helps to clarify how to address and work through these problems as quickly as possible. I involve clients at every stage of the assessment process. I believe in the value of understanding the client’s unique perspectives. This helps me to learn more about the client’s challenges, choose appropriate psychological tests and accurately make sense of test results. In addition to identifying and working with areas of difficulty, I focus on the client’s strengths. With problems and strengths understood, solutions become more visible. In my practice, comprehensive assessment is offered for children and teenagers. A comprehensive assessment includes a broad range of tests. This type of assessment offers an in-depth picture of what is troubling youth and/or their parents. Targeted assessment is offered for people of all ages. A targeted assessment includes fewer tests than a comprehensive assessment and takes a shorter amount of time to complete. I use this type of assessment to gain a better understanding of the most pressing problems for the client. 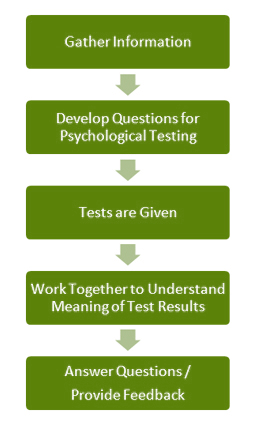 My ultimate goal in the testing and assessment process is to find meaningful solutions for emotional challenges. I begin by gathering information from the client about his or her life experiences, current problems and personal strengths. I encourage client curiosity as we develop questions to be answered through the assessment process. I choose appropriate tests to best answer the client’s questions and address his or her needs. My approach with children/teenagers and adults is similar. However, there are three main differences. Unlike the one-to-one process I use with adults, information about child and teenage clients is gathered from the parents and the young person. They both develop their own questions. Together the parent(s), client and I discover meaning from assessment findings. The parent(s) and I explore whether there are other important people in the child’s or teenager’s life who could provide additional information that would be helpful for the assessment. I sometimes create stories for children and teenagers to communicate assessment findings in ways that youth can more easily relate to and understand.